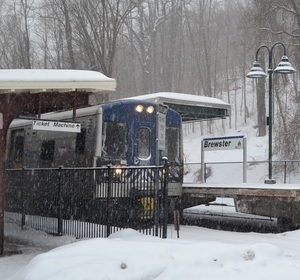 With the projected inclement weather predicted for our service territory, customers are advised to monitor mta.info, social media feeds or call our Customer Information Center at 511 (in Connecticut call 877-690-5114). For additional information see our Guide to Winter Weather Travel at http://web.mta.info/mnr/html/WinterWeatherTravelTips.html. We urge all our customers to take care when traveling. Stay clear of the platform edges, use handrails, and walk carefully when entering or exiting stations and boarding or leaving trains. Please allow extra travel time when traveling during the storm. We will have personnel and equipment pre-positioned to be prepared for storm related issues. Please listen for announcements at your station.